Sometimes, we all just need a good pep talk to get our creativity and confidence into shape. And who better to give that to us than the host of the Creative Pep Talk podcast himself, Andy J. Pizza (a.k.a Andy J. Miller)! 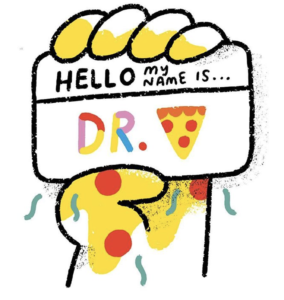 Dr. Pizza, as he’s sometimes called, has made a living out of his amazing illustrations and by inspiring and helping artists and creatives from all corners of the artistic world to be their best creative self with a positivity and upbeat attitude that makes him Bob Ross levels of encouraging. 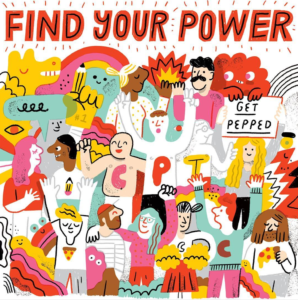 Whether you’re dealing with impostor syndrome, creative perfectionism, or fear of failure, there’s a Creative Pep Talk ep for that. We talked to Andy J. Pizza about how he got his start, whether working on his podcast episodes helps him with his own creative struggles, about the keys to marketing yourself as an artist, and everything in between (including Moana). Check out the interview! Haha! Well I have a genuine obsession with pizza. But here’s what happened: I was sick of my domain name Andy-j-miller.com (too many hyphens! ), so when the new domains were released a few years back I snatched up andyj.pizza. It was meant to just be a domain name, but people started calling me it! As for favorite pizzas, I don’t discriminate. I love a fancy pizza covered in roasted duck, apple, goat cheese and a fried egg eaten on a beach in the South of France nearly as much as I enjoy a microwaved slice of pepperoni from yesterday’s $5 bargain hot and ready. In my stomach, there’s a strict adherence to my personal constitution: All Pizza is Created Equally. You’ve done work for awesome brands like Nickelodeon, Nutella, and Oreo to name a few! What project has gotten you the most excited so far? What did you learn the most from? I think the work I’ve done with Nickelodeon is probably closest to my heart. But the project that taught me most was probably with this company that I won’t name. When I was first starting back in 2010, I worked on several projects with this absolutely garbage company that was a complete and utter mess, but I didn’t have a choice because I didn’t have a lot of options to pay my bills at the time. The owner of the company was deeply involved in every decision and it was pure chaos. These projects were incredibly difficult, but they taught me so much. They were like this crucible that made me a real pro; they pushed me to my breaking point and taught me how to stand up for myself. From that point on, I’ve been much better about asking for what I deserve and demanding to be treated fairly and with respect. How did you get your start in illustration? Did you ever have the “quit my day-job or stay put” dilemma? Yeah, many times. I’ve never had a proper full time job, actually; I’m not great in those situations. I’m pretty confident that I have a knack for real creative work, but I’m just as confident that I’m below average at lots of normal things and I’ve never done super well in traditional employment. So I’ve always been looking for ways to avoid it at all costs! As somewhat of an entrepreneur/small businessman, you never stop going through this dilemma. This career path is a series of breakthroughs and pivots. Whether it’s moving on from a regular client or just shifting your style or positioning in the market, you’ve got to develop a good process and intuition for making tough calls. 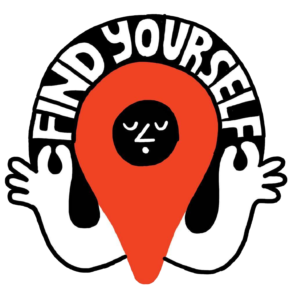 You host one of my favorite podcasts, “Creative Pep Talk”! Sometimes, does recording an episode about, say, creative block actually end up helping YOUR creative block? Thank you!!! The short answer is this happens ALL THE TIME. In fact, most episodes are about a lesson that I learned just the week before. I feel like this process of synthesizing these lessons has grown my creative work in substantial ways. I’m grateful to have this outlet for systematically working out my own creative career in real time and sharing the entire process as I go. 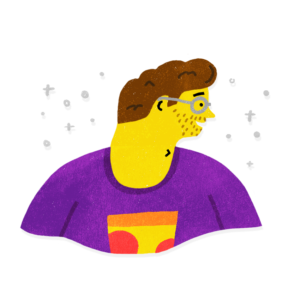 How do you balance doing art for fun, for work, and for “Creative Pep Talk”? Although I give a lot of advice, I still have tons of things that I’m terrible at! Balance is not a strength of mine, but I will say that the more self-aware I become, the better I get. For me, being a student of your own rhythms and behavior is essential to success. I’ve realized that sometimes when I’m stuck on client work, it’s actually more productive to step away and make something fun than to sit and try to grind it out. I’ve kind of been on a lifelong pursuit to make these things one in the same. 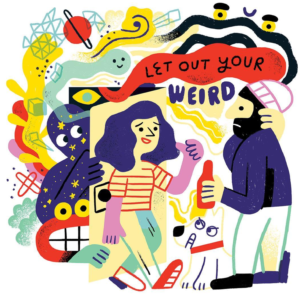 Creative Pep Talk has become paid and fun work at the same time. Kind of secretly, it isn’t really a podcast about giving creative career advice; it’s an elaborate art project. I think that many episodes of the podcast are the most creative things I’ve ever done. I’m trying to make these episodes art. As silly as it may seem, I see them as my attempt at philosophy, (bad dad) comedy, poetry and illustration all rolled into one. That sounds loftier than I mean it to, and it makes me a little uncomfortable, but really I just dedicate myself to having as much fun with it as I can. Between your podcast, your own art, and your blog posts, you have a LOT of channels you’re putting creative energy into! 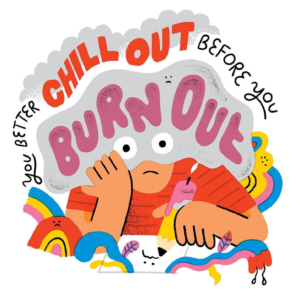 You have a recent episode about this too, but how do you avoid creative burnout? 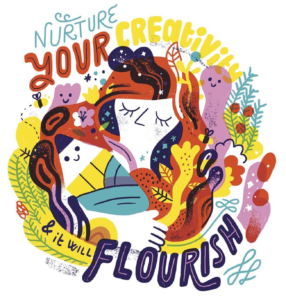 I sell a notebook that says, “Creativity is like Breastfeeding: the More Your Pump, the More it Flows!” I avoid burnout by having multiple channels. 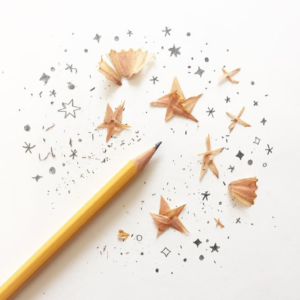 I’m not the first person to discover this, but it’s so true in my life: the easiest way to stay inspired and fresh isn’t to be economical with your creativity; it’s to create an interworking ecosystem of creativity. Many historically great artists worked on multiple projects at any given time, and on different levels. Sometimes amazing painters are terrible guitar players, but the songwriting sharpens the painting and vice versa. So in my life, my client illustration work, the stuff I draw with my 4-year-old son, my products and my podcast all feed and stimulate one another. How did you spread the word about your work and get it out there when you were just getting started? Marketing is a tricky task and it’s always changing, so what I did in 2008 doesn’t work anymore. But if you boil it down, there are two core principles that will always be at play: provide value in exchange for attention and connect with other people. Whether it’s a podcast or a blog or an Instagram project, if you can deliver value (of any kind) on a consistent basis, it will slowly spread. By the way, value is a broad term that just means something people desire. People desire all sorts of things. They want to learn, yes, but they also want to feel. 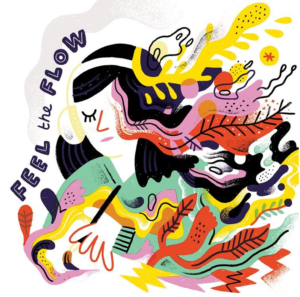 Can you make art that really makes people feel something? Do that constantly in exchange for attention and it will spread. The other core concept is connecting with other people. Relationships. Form every kind of authentic relationship you can. Collaborate, get drinks, promote other people, send friendly emails. There’s no way around it: you need to be making strong, authentic connections with other people if you want your work to spread. Social media and marketing yourself is something a lot of artists struggle with – what advice do you have for fellow creatives trying to build an audience? Be Generous: Change your perspective. Forget, ‘what I can I take from an audience’ and think, ‘what can I give?’ If you can deliver generous value for your audience, things will slowly but surely grow. One thing I love about your podcast and posts is that you use your own art as the featured images – would you recommend other artists have a blog that features their own art to get it out there? I don’t think every creative needs to be a creative guru, so to speak. I think if you’re naturally inclined, it can be a good move. However, I am a big believer that you have a lot to gain from being the total package at an early stage in your career. I think that eventually you should focus on your strengths, but early on I think you need to take your career into your own hands by handling everything yourself. You don’t want to be in a position where you have to wait for permission from anyone else. So if you’re an actor, don’t wait around for someone to hand you a script; write your own. If you’re an illustrator, don’t wait to be handed articles to illustrate; write your own. Not only does it give them the ability to take their destiny into their own hands, it also helps them understand their primary role in a much deeper way. For instance, when you write your own article, you have a different perspective on the purpose of the accompanying illustration. This carries over to when you finally get the chance to illustrate someone else’s article. 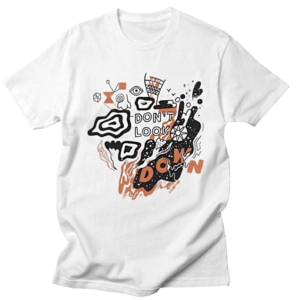 You recently designed a t-shirt for the COUP Tees charity Artist Shop to benefit the ACLU. Would you encourage other artists to do art for charities? I think it’s good to do when the right opportunity hits you. But I think a more powerful practice is to see all of your work through this lens. I like Steve Jobs’ view that everything he did was for the betterment of the world. I will never have the kind of impact he did, but I like to think about my creative work as the best contribution to society that I can give, and when you separate charity from your regular work, it’s easy to allow yourself to think that your regular work’s purpose is solely selfish. Like when you start a business with good intent for the world, many people will tell you it should be a non-profit, but shouldn’t all businesses be intended for the betterment of mankind? What kind of evil person starts a business thinking it will hurt other people but benefit them and that’s somehow ok? Finally, what’s a quote or song that’s been inspiring you lately? I’ll be honest, it’s the Moana soundtrack. I know that seems a bit ridiculous, but I’m not the first artsy dad to be obsessed (myself, illustrator Rogie King and designer Tyler Deeb all bond over this on twitter). Part of the reason this film is so good is that it’s deeply tapped into myth and spirituality that transcend a regular kids film. The soundtrack is by the creator of Hamilton, Lin Manuel Miranda, and the songwriting is so good! It tackles these complex conflicting emotions we all have. My favorites are the songs about personal identity: like ‘who am I?’ I mean, come on! Is there a deeper question than that?? As a father, I think a lot about how to get the best out of my kids, and I know from when I was a kid, the most powerful thing my parent could do when I was struggling wasn’t to shame me, but to remind me that I was better than my failure. I love the lyric “This is not who you are” because it’s a poetic reminder that you will fail but that doesn’t make you a failure. Feeling inspired? Try Artist Shops for free and start your own creative journey! 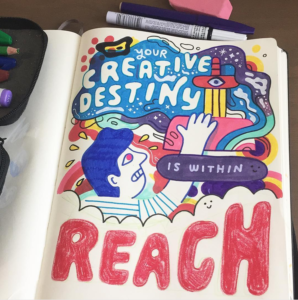 1 responses to Get a Creative Pep Talk With Andy J. Pizza! Previous post Introducing The Threadless Podcast!